Tourism Himalayas representative pick up you from hotel at Delhi and transfer you to railway station to board train to Kathgodam. From Kathgodam, you will be driven to Munsiyari. On arrival at Munsiyari, check-in at your pre-booked hotel. Freshen up and relax. Have a very hearty breakfast at the hotel. Enjoy full day sightseeing tours and holidays activities in Munsiyari. It is a breathtaking hill station. 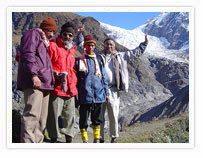 It attracts tourists, nature lovers, mountaineers, glacier enthusiasts, and trekkers. It offers panoramic views of majestic Himalayas. Major attractions in Munsiyari include Khaliya Top & Betuli Dhar, Thamari Kund, Nanda Devi Temple, Birthi Fall, etc. Have a relaxed breakfast at the hotel. Later drive to Pithoragarh en route enjoying scenic beauty of landscapes. On arrival at Pithoragarh, check-in at hotel. Freshen up and relax. Spend rest of they day at leisure enjoying you own holiday activities. After breakfast at the hotel, embark on sightseeing tours of Pithoragarh covering Thal Kedar, Patal Bhuneshwar, Kapileshwar Mahadev, Gangolihat, etc. Enjoy breathtaking views of mountain peaks. Have your breakfast at the hotel. Later you will be transferred to Kathgodam Railway Station to board train back to Delhi.